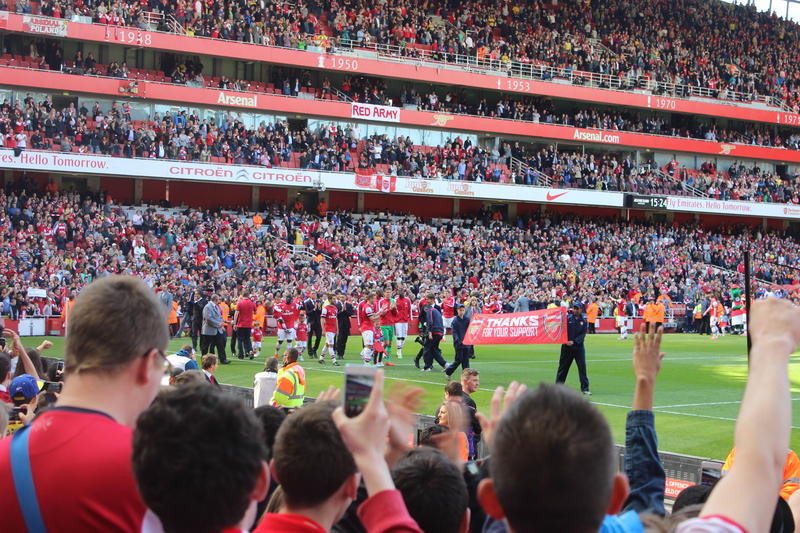 The home schedule is over for another season at the Emirates, with fourth place secured the only motivation for the Gunners were to get three points on the board to send the Arsenal fans home happy one last time. Of course the FA Cup will be the final thank you (if won) to the fans but as we know the majority won’t have the opportunity to support the team at Wembley. The football wasn’t the greatest yesterday, the pressure was off after Everton conceded fourth place to Arsenal and even though West Brom tried in the back of their mind they see themselves safe from relegation. Norwich did manage to come away from Stamford bridge with a point as Chelsea’s pathetic end to the season spluttered on however the chances of being overtaken by the canaries still are a very long shot. Both sets of fans were in a good mood, the weather was sunny and kept the mood jolly. West Brom fans came armed with a variety of beach balls which we’re bouncing around the away end until the stewards got their hands on them. With fourth placed secured many wondered if most the 1st team would be rested for the game, news filtered through before the match that Abou Diaby was on the bench and Aaron Ramsey would not be involved. I suppose the possibility of wholesale changes would be slim since all week the team would have been set out in training to get the win, the bonus of Everton losing came too late in the day to change all preparation for yesterday’s game. Ramsey was afforded the break which was good however a much weakened team would be expected for the Norwich game. 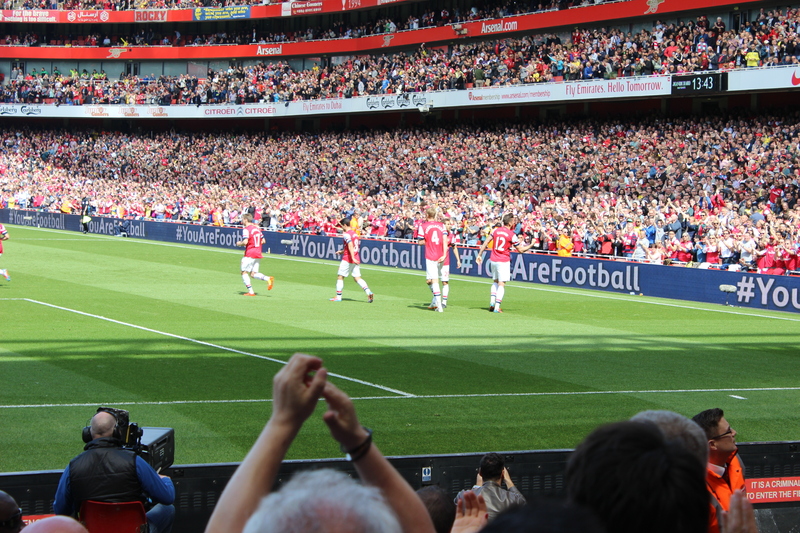 It would have been nice to see Abou Diaby make an appearance in front of the fans but an injury to Nacho Monreal equated to the final substitution of the day being a forced one. Arsenal’s very own ‘Mr Glass’ is likely to still be around next season, hopefully for a lot longer than he managed this season. The same can’t be said for Kim Kallstrom, he will be returning to his parent club once his contract runs out. After all the kerfuffle over his transfer to the Gunners his impact was quite minimal. No fault of the player himself but by the time he was finally ready; our premiership campaign was effective dead and buried. One person whose future is still uncertain is that of Bacary Sagna, he hasn’t signed a new contract and the chances of him staying are pretty slim now. In the stands we sung his name during the game, letting him know we want him to stay however we have been in this position many a time over the years . To lose the Frenchman would be a big loss however no player is irreplaceable (ahem. Thierry Henry?) in most cases. Those right-back shoes would be big ones to fill but if it happens we just have to get on with it. My only hope is if Bacary does move on it isn’t to a premiership rival, it just doesn’t sit right with me. The Robin van Persie transfer to man united never should have happened and although the club had a say in that transfer it is more or less powerless with Sagna. We can only ask him to think about the fans that have supported him all these years before signing on the dotted line for another premiership club. Looking back now on what could have been this season, a top four finish and (hopefully) FA Cup trophy is far from disaster. The important thing is to learn from the mistakes this season and put them right next. The Norwich game is meaningless to me now; all I would like from it is some youngsters to play and stake a claim for next season. Victory on May 17th is vital to finish the season right. Hello all, please enjoy the guest post. My views on England’s pursuit of Carl Jenkinson were addressed in an earlier post however I’m open-minded enough to see another persons take on the matter, enjoy. Arsenal fans already aware of how far Carl Jenkinson has come on this past season will rightly agree that the young defender deserves a call-up to the England team. Although still 20-years-old, Jenkinson has excelled in the early stages of this season, filling in for first-choice Bacary Sagna at right-back. Jenkinson has been one of Arsenal’s top performers and his nine appearances so far this season have coincided with the Gunners’ defensive tightening that has seen us concede just eight in 10. Wenger’s side once again look an attractive proposition with fans placing a bet on who wins Premier League. He is a different player to the one that started in Arsenal’s 8-2 drubbing of Man United just a year ago and he had Man City’s £6.2m man Scott Sinclair in his pocket last month. So consistent has Jenkinson been that there were strong calls for him to be given an England call-up for last week’s international break but appearances for Finland at under-21 level means he cannot play for Roy Hodgson’s side unless the FA appeal for clearance to transfer nationalities. There are strong hopes that the FA will get this matter sorted quickly, so that England can have a half-decent right-back in their defence for once. England managers have been somewhat restricted with the availability of international-class right-backs since Gary Neville showed clear signs of deterioration around Euro 2004. Still only 20, there is a lot for Jenkinson to learn but his performances this season for Arsenal suggest that he can go far for both club and country. It has been a quiet week for Arsene Wenger as most of our players have hooked up with their national teams to go and pick up an injury or two and take the sting out of any momentum we had at this early stage of the season. In actual fact though, rather than in previous seasons where there are more footballers on twitter than on our training ground during the international break, there are a few players coming back from injury and with Arteta struggling to get a look into the Spain squad, there is a little bit more life on the training ground than usual. Arsene Wenger will love this! He absolutely hates letting his players go away with their national sides as they are then out of his control and more than often come back with little niggles. A lot of football blogs might say that Wenger is a little bit unreasonable in his resistance but when you look at the damage that has been done to RVP over the years while away with Holland and more recently Jack Wilshere with England, you can see where the resentment stems from. With the likes of Arteta, Wilshere, Frimpong and Sagna all still around, this time will give Wenger a chance to work on things on the training ground while allowing those on the injury comeback some more time to build their fitness. On the back of the farce of Internationals, Wilshere, Sagna, and Frimpong will be closer to a first team return, while Szczesny and Diaby will be making progress on their injuries. It was good to see Sagna play an hour for the U21s in midweek in the 2-0 win over Reading at Barnet. Although Jenkinson has made great strides and really stepped up to the occasions in the Frenchman’s absence, it is always nice to get a senior player back in the side. Especially one as consistent and accomplished as Sagna. Then of course we are all looking forward to Wilshere making his return to the first team. The thought of him linking up with Carzola and Arteta in midfield is mouth-watering, and one that every fan should be excited for. Of course it is great that we have our players representing their countries but it is nice to be a little bit more relaxed throughout the World Cup qualifiers without fearing for any injuries to key players. I know we still have a number of players who could pick up knocks, but it is good to know that we have a lot of things to look forward to on the back of next week. This international break will actually be very much welcomed! Today’s post was brought to you courtesy of Luke Malcher at ThePlayersNet.Com . A quality football blog worth checking out. Please feel free to like the Facebook page. The international break is trudging along at a snail-like pace and boring the pants off premiership football fans across the land. I know there are those of you out there that actually have a concerted interest in their national team’s fortunes and follow their games at the same level as they would a club at domestic level. Don’t get me wrong I’m fully behind England and want them qualify for the world cup I just wish I had the equivalent of a Sky +/Tivo remote so that I could fast forward past all the advert like qualifiers and get straight to the good stuff: the finals. Now with most of our squad away with their national teams the focus over the past few days has been focused on those players who have not been called up to their national squads; most notably Carl Jenkinson and Mikel Arteta. Our rejuvenated full back Jenkinson has been the subject of many pundits opinion on whether he should pledge his future to England before Finland snap him. As we all know he qualifies for Finland through his mother and has represented Finland for the majority of his youth up to U-21 level. I have been very impressed with Carl Jenkinson this season along with everyone else who has watched him. I feel his performances have been deserving of the plaudits but I do feel the England calls have been very knee jerk which is a common fault with the English press/pundit system. We are quick to jump on the bandwagon of any players that emerge and tend to throw them to the top of the tree before they have had a chance to prove themselves. Maybe I’m old school but I feel some players are elevated to international football far too quickly; we end up with a high number of players on the scrap heap with a few international caps because they were thrown in the deep end and then the national exposure highlighted parts of their game that was not up to standard yet. There is no patience playing for England, its sink or swim and many a time players sink because it’s too much too soon. There’s nothing to say they will not be great players but my argument is that a good start to the season should not mean a starting spot for your national team. An apprenticeship should be followed; if a player is under 21 he should play for the under-21’s at some point then experience being called up to the full squad to train with the seniors but not play any games for a few call ups until they are deemed by the manager to be on same wavelength as the senior players. Many players that are deemed true talent are fast tracked straight into the full squad, our own jack wilshere is one of those players who bypassed his apprenticeship but his quality was evident from the off and he definitely swam when thrown in. when you see a player like Raheem Sterling who in my opinion is going to be a massive player seeing him in England squads already is a bit of an insult. We must also consider that the fast tracking and avoiding the apprenticeship can have a detrimental effect on the player’s psychology. When you give a young player too much too soon it can harm their career as they lose their humbleness and start believing they have made it, they are surrounded by people telling them how great they are, they are representing their country and everything seems easy before their career has even started. David Bentley could be an example of such a player, where is he now? Despite being a complete knob he did have talent but he believed he was the next David Beckham without putting in the work David Beckham did to become…David Beckham. Now he is trying to reinvent his career somewhere in Russia. Now the example I used for Raheem Sterling is possibly one similar to Carl Jenkinson, the England hierarchy want to secure their services for England before they pledge to their other eligible countries (Jamaica and Finland). But I feel despite the possible chance of missing out on a player because they are offered international football a lot sooner; it says a lot more about the player’s character. If you have real plans to be a top player then im sorry Finland and Jamaica are just not going to put you there. If you as a player really want to reach the top and England is your option then you must be prepared to wait for when you are ready to represent England and not settle for the easy option elsewhere. Its playing for England that will give you the opportunities to play in international tournament showpieces (how well they do when they get there is another story). But it is the utmost importance that when representing your country you have earned the right and have not got there by default. A player like Stephen Warnock at Aston Villa was part of the England squad during the world cup in 2010, today if you ask anyone their opinion of the player you will struggle to find anything positive said about him. Had he become a bad player overnight or was he never good enough to start with? Now is Carl Jenkinson a player good enough to play for England? The answer is yes. Is he ready to be England’s first choice right back? I would say no. I have to take my arsenal tinted glasses off and admit there are English right backs well ahead of him at this time. Carl has had a great start to the season and what he needs to do is put the international talk aside and focus on building on his development this season. 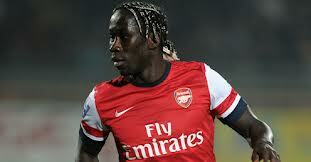 The only real test this season he should face is the competition when Bac Sagna returns to the first team squad. England selection is not a burden he needs right now, his fight is for the right back spot at arsenal is. If he can overcome that hurdle then he may be ready to move on to the next stage which is international football. In fairness Jenkinson has played down the England talk and I hope he continues to do so. I do believe in him but I just don’t want him to be thrown in the deep end before his time. He has made a great start to the season but it is only 7 or so games this season I believe he needs to continue on this season as he’s going then maybe come end of the season the England people can really assess his capabilities. It was good he wasn’t included in latest squad, at the moment he is first choice at Arsenal by default but let’s see if by end of season he is first choice by merit. NB: No disrespect is meant in this post to Finland or Jamaica. If a player feels strongly enough to represent their country of birth then fair play to them. With all the transfer talk over the past week or so focusing on the potential strikers, midfielders and centre backs coming into the club it seems one vital area of the Arsenal team has been neglected. The right back position in my opinion is an area that will require attention before the season starts. I am sure Arsene Wenger has taken this into consideration and possibly has it all worked out already but I believe any decision lays heavily on the developments of Bacary Sagna’s recovery from his fractured right fibula. The right back area is equally as important an area as any of the striking positions or midfield and we need to make sure we are covered adequately enough in that position. Bacary is the main man in that position and so any right backs during his extended period on the side-lines merely serve the purpose of keeping his seat warm until he returns. 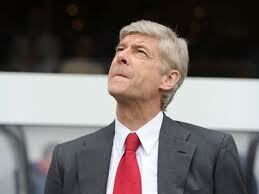 And there is where the problem lies, how long can we cope without cover of the same calibre of Sagna? 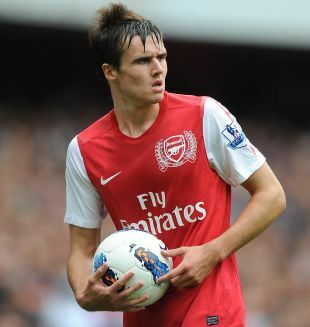 In the current squad the obvious candidate to fill that void is Carl Jenkinson. 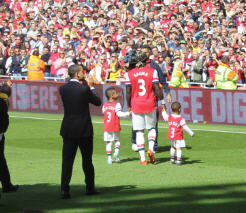 My question is whether young Carl can raise his game to reach such heights that we are not calling for Sagna’s return. I believe in Jenkinson’s abilities however I class him more as potential rather than the finished article. He is Arsenal through and through and would give everything when on the pitch; he loves the club and that is a great motivation for any player. He is still learning his craft though and still has a few things he needs to work on with his defending. One thing Arsene Wenger has not been scared of is to throw youngsters he believes in into the deep end and see if they could sink or swim. He certainly did that with Ashley Cole a few years back, Clichy too and last season he planned the same with Kieran Gibbs. Unfortunately for Gibbs injuries certainly disrupted his promotion however he has grown into that role when he has had a run of games. Beyond Carl Jenkinson there is not much on offer for cover if in the unlikely event Carl also requires time on the side-lines. We experimented with a number of players in the right back position when Carl and Bacary were injured last season to mixed results. We experimented with Centre backs playing in there. 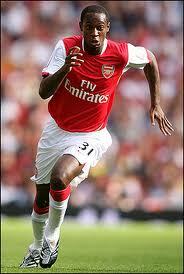 Johan Djourou had a stint there. At the time we had were fully stocked for centre backs and the right back availability was a chance for Johan to get into the team. Although Johan started off ok in that position, he added height at the back and was generally comfortable on the ball he didn’t offer much in an attacking sense to the team which is understandable. He was also suspect against any attacking players who dribble at the defender. He was found wanting a number of times against those types of players. Junior Hoillet, Antonio Valencia and Nani come to mind. In his defence he is a centre back by trade and was doing his bit to help the team by covering at a time when we needed cover. Laurent Koscielny also had a few games at right back and to be honest was quite impressive there. I believe he mentioned in an interview he has played there previously in France and does not find the position too alien to him. One drawback from that arrangement was that from all the good we gained from Koscielny playing right back we missed his presence and all the positives he brought to the centre of defence. We needed him in the middle more than at full back and in conjunction with Mertesacker’s injury against Sunderland that option became null and void. The midfielders gave it a try too. Francis Coquelin slotted into the right back position and was quite impressive there however maybe due to the extra sprinting that position involves he obtained a few injuries which were in effect muscle pulls. In the grand scheme of things Coquelin is a midfielder and that is the position he learned his craft and sees his future so any stint at right back was merely short-term solution. Adaptability is no bad thing and I’m sure he is prepared to play there if ever needed. Nico Yennaris is another player who is a midfielder primarily but had played a few games at right back last season. He actually played alright in that games but is very raw and would benefit more from a loan spell to aid his development. I would not expect him to be called upon apart from maybe Carling cup games. One thing that strikes me is over the years we have churned out so many promising left backs yet in the right back position we have tended to always have established more experienced right backs purchased. I cannot remember the last time a young right back has been on the lips of gunners fans as one to watch out for. Justin Hoyte is the last youth player I can recall who broke into fringes of the first team and maybe Kerrea Gilbert but those two players never really fulfilled any promise. At present there are a couple of names in the youth set up who could possibly make the breakthrough though it is still quite early days for them. The Neymar lookalike Martin Angha and his Swiss compatriot Sead Hajrovic are just names for the future for now. We clearly need to buck the trend and produce some future Arsenal right backs.